Manufacturer & Exporter of Raw Mica. Our product range also comprises of Mica Blocks, Mica Splittings and Fabricated Mica. We offer Raw Mica to our clients. The word "mica" is derived from the Latin word mica, meaning "a crumb", and probably influenced by micare, "to glitter". 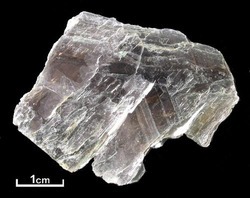 The raw mica group of sheet silicate (phyllosilicate) minerals includes several closely related materials having close to perfect basal cleavage. All are monoclinic, with a tendency towards pseudo hexagonal crystals, and are similar in chemical composition. The highly perfect cleavage, which is the most prominent characteristic of mica, is explained by the hexagonal sheet-like arrangement of its atoms. Looking for Raw Mica ?